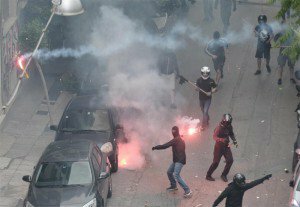 Today violent clashes in Thessaloniki and Athens broke out between masked youth and university students affiliated to New Democracy’s youth party, DAP-DNFK. The incidents took place at both the Theological School at the Aristotelian University of Thessaloniki and outside the Athens Pedagogical Institute on Navarinou street, according to sources. The masked youth armed with flares and axes attacked the students, as reported by enprotothema.gr. In Athens, police arrived on the scene and chased the attackers into the Exarchia area while in Thessaloniki a student sustained an injury to the head.